On a visit to Costa Rica last spring, we saw first hand what has become the fate of native cattleya species around the world. We found both Cattleya skinneri (the national flower) and Cattleya dowiana in full bloom as we traveled the countryside and it was nothing short of a religious experience. It is one thing to grow these wonderful plants in captivity using clay pots and climate controlled greenhouses but quite another to see them hanging from trees and subjected to the elements. Much to our surprise, however, the orchids were not growing in the cloud forests along with the other impressive biological diversity as we were expecting. Instead, the cattleyas had been removed from the jungle trees and were now blooming in local resident’s yards. It seems orchid growing is a popular hobby even in the developing world. In Costa Rica, laws have been passed recently which make it illegal to collect wild cattleyas. This action, though well intentioned, is too late as the plants are almost extinct in the forests. The local newspaper reads “Flor Nacional Esta Practicamente Extinquida En Su Habitat Natural”. We were very moved by this shocking realization and motivated to somehow improve the situation. We looked at a number of options including donating hundreds of our mature plants currently in production as well as raising a new crop of seedlings just for MCL to re-introduce into their 54,000 acre protected forest (located about 70 kilometers northwest of San Jose). There was local concern, though, that the commercially grown species were not from the exact gene pool as their jungle plants and would display artificially improved flower characteristics in areas such as shape, color, and size. The re-introduced seedlings had to be created using local plants. 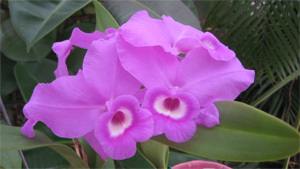 It was decided that a new orchid production facility in Costa Rica was needed and would be partially funded through the sale of our cattleya plants here in the U.S. The goal would be to raise $10,000 through plant sales and another $10,000 from donations. The money would be used to build a small seed sowing laboratory and several greenhouses near Monteverde with which to grow the seedlings to maturity. When close to blooming size, the plants would be taken to the forests and tied to the trees by the MCL volunteers. The seed pods themselves would be made using the few plants remaining in the wild. Cattleya skinneri, which is celebrating it’s 65 th anniversary as the national flowAir Transportationer this year, will be re-introduced first with Cattleya dowiana to follow. It will be of great importance to keep the problem of over-collecting from happening again once the new plants are introduced. To address this issue, the local people will have to be involved in the project from the beginning so that they will have a stake in the successful outcome. Many employment opportunities will exist including construction of the lab and greenhouses, growing the plants in all stages, and guarding the forests. One possible source of revenue could be selling a portion of the young seedlings to tourists, an action that is especially attractive since it also lowers the demand for wild collected plants. Since there are a million seeds in a single pod, there should be plenty to go around. 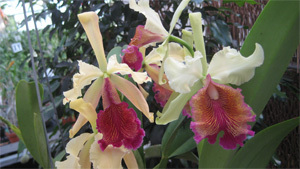 Over-collecting of orchid species is a threat all over the world. It is our hope that this cattleya re-introduction project will not only be successful but also serve as a model for others to follow. The MCL is a non-profit organization dedicated to the conservation of the tropical forest. Its mission is to conserve, preserve, and rehabilitate tropical ecosystems and biodiversity. Founded in 1986 in Monteverde, Costa Rica, the group has purchased through donations 54,000 acres of primary and secondary forest, the largest private reserve in Costa Rica worldwide known as Children’s Eternal Rainforest or Bosque Eterno de los Ninos (BEN). Go towww.acmonteverde.com or www.childrenseternalrainforest.org to learn more about the MCL and BEN. For U.S. Residents: Consider making a tax deductible monetary contribution (in US dollars) to the Monteverde Conservation League - U.S. and request that the donation go towards the ‘Orchid Project’. Go to www.mclus.org for more details. For Ecotourists: Consider spending your next vacation in Costa Rica - a nation that has 12 distinct ecological zones that are home to approximately 5% of all known species on earth including 1400 orchid species. The country has one of the world's best conservation records – nearly 25% of the land is protected.